The title of the book perfectly coincides with the content. A Kaleidoscope has various faces which shows the beauty of the colors. 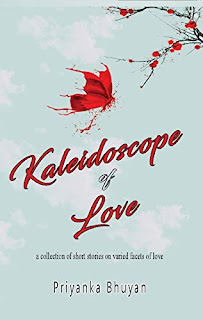 In this, the book acts as a Kaleidoscope sowing the various facets of Love. If this is the first book for the author, which I presume it is, hats-off to her for bringing such a varied emotions revolving around LOVE in a subtle manner. No wonder, these stories got picked up by the publisher under Wordit Art Fund. Each story is unique and shows a wide range of emotions with ease. It involves Love, Compassion, Sacrifice, Realization among others. If you ask me as a reader to select one among these, I seriously would be left in dilemma since each story has such an appealing connect with you. I am sure that if you are the one who appreciate the genuine effort that revolves around human emotions, this is the best book out there which you should grab it instantly. This book is available on Amazon , Flipkart and on Google Playstore. Book Review - Sadhana Who Stalked Her?